Plano is a thriving city in Texas with a population of 286,057 as of 2016. Law Street Media and 24/7 Wall Street named Plano TX as one of the best places to live and work in. The median age is 38 while the median household income is $83,793. Summers can be hot. Plano TX is no stranger to winter storms, high winds, and gutter repair in Plano. 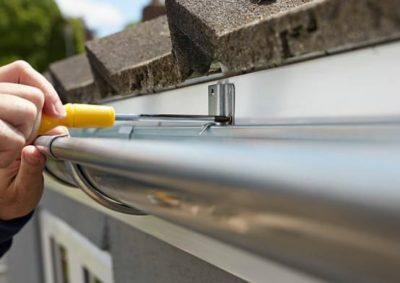 A gutter repair is an important part of home maintenance. Because your gutters regularly face the harsh elements, they get prone to damage. Gutters also deteriorate because of the weight of accumulating leaves, debris, and snow. StormPros is your expert when it comes to keeping your gutters in good shape. Whether they’re affected by bad weather or were poorly installed, we’ll fix them right away. Why do you need our gutter repair services? Properly functioning gutters allow water to flow away from your house instead of pool around it. Keep your home free from moisture and furniture damage. At StormPros, our goal is to help you achieve a home that lasts and stays problem-free all year round. No matter what gutter issue you’re facing, we’ll deal with it in a timely and efficient way. Don’t just call StormPros when you notice the signs above, do it especially after a storm. We make sure that your area stays clean and clutter-free while we work. We explain any problems we discover and the gutter repair process. We also do gutter installations and use topnotch materials. We are licensed and insured. We offer honest and detailed estimates. We are local, which means that you can reach us anytime. Call StormPros today at 214-227-2763 for a site inspection and estimate.